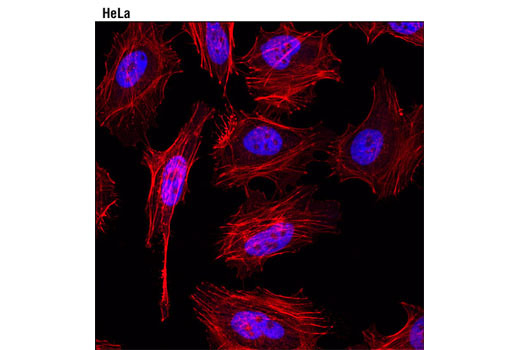 Confocal immunofluorescent analysis of HeLa cells using Tri-Methyl-Histone H3 (Lys4) (C42D8) Rabbit mAb (Alexa Fluor® 647 Conjugate) (pseudocolor blue). Actin filaments were labeled with DY 554 phalloidin (red). Human whole blood was fixed, lysed, and permeabilized as per the Cell Signaling Technology Flow Alternate Protocol and stained using Tri-Methyl-Histone H3 (Lys4) (C42D8) Rabbit mAb (Alexa Fluor® 647 conjugate). 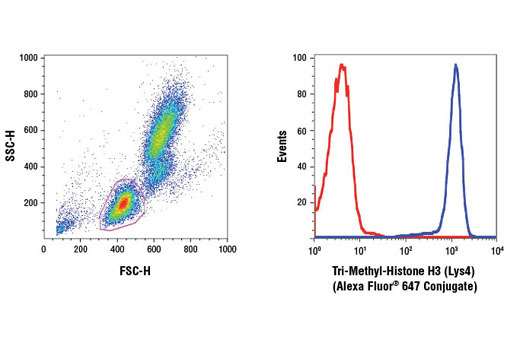 The forward/side-scatter lymphocyte gate was applied to a histogram depicting the mean fluorescence intensity of Tri-Methyl-Histone H3 (Lys4) (blue histogram) versus that of a concentration-matched Rabbit (DA1E) mAb IgG XP® Isotype Control (Alexa Fluor® 647 Conjugate) #2985 (red histogram). Tri-Methyl-Histone H3 (Lys4) (C42D8) Rabbit mAb (Alexa Fluor® 647 Conjugate) detects endogenous levels of histone H3 when tri-methylated on Lys4. This antibody shows some cross-reactivity with histone H3 that is di-methylated on Lys4, but does not cross-react with non-methylated or mono-methylated histone H3 Lys4. In addition, the antibody does not cross-react with methylated histone H3 Lys9, Lys27, Lys36 or methylated histone H4 Lys20. Monoclonal antibody is produced by immunizing animals with a synthetic peptide corresponding to the amino terminus of histone H3 in which Lys4 is tri-methylated. This Cell Signaling Technology antibody is conjugated to Alexa Fluor® 647 fluorescent dye and tested in-house for direct flow cytometric and immunofluorescent analysis in human cells. The antibody is expected to exhibit the same species cross-reactivity as the unconjugated Tri-Methyl-Histone H3 (Lys4) (C42D8) Rabbit mAb #9751. The nucleosome, made up of four core histone proteins (H2A, H2B, H3, and H4), is the primary building block of chromatin. Originally thought to function as a static scaffold for DNA packaging, histones have now been shown to be dynamic proteins, undergoing multiple types of post-translational modifications, including acetylation, phosphorylation, methylation, and ubiquitination (1). Histone methylation is a major determinant for the formation of active and inactive regions of the genome and is crucial for the proper programming of the genome during development (2,3). Arginine methylation of histones H3 (Arg2, 17, 26) and H4 (Arg3) promotes transcriptional activation and is mediated by a family of protein arginine methyltransferases (PRMTs), including the co-activators PRMT1 and CARM1 (PRMT4) (4). In contrast, a more diverse set of histone lysine methyltransferases has been identified, all but one of which contain a conserved catalytic SET domain originally identified in the Drosophila Su(var)3-9, Enhancer of zeste, and Trithorax proteins. Lysine methylation occurs primarily on histones H3 (Lys4, 9, 27, 36, 79) and H4 (Lys20) and has been implicated in both transcriptional activation and silencing (4). Methylation of these lysine residues coordinates the recruitment of chromatin modifying enzymes containing methyl-lysine binding modules such as chromodomains (HP1, PRC1), PHD fingers (BPTF, ING2), tudor domains (53BP1), and WD-40 domains (WDR5) (5-8). The discovery of histone demethylases such as PADI4, LSD1, JMJD1, JMJD2, and JHDM1 has shown that methylation is a reversible epigenetic marker (9). Peterson, C.L. and Laniel, M.A. (2004) Curr Biol 14, R546-51. Kubicek, S. et al. (2006) Ernst Schering Res Found Workshop , 1-27. Lin, W. and Dent, S.Y. (2006) Curr Opin Genet Dev 16, 137-42. Lee, D.Y. et al. (2005) Endocr Rev 26, 147-70. Daniel, J.A. et al. (2005) Cell Cycle 4, 919-26. Shi, X. et al. (2006) Nature 442, 96-9. Wysocka, J. et al. (2006) Nature 442, 86-90. Wysocka, J. et al. (2005) Cell 121, 859-72. Trojer, P. and Reinberg, D. (2006) Cell 125, 213-7.